Rediscover NEW & IMPROVED Motions hair care products on your next wash day. We all know how important it is to find products that suit our natural hair textures. Nothing is worse than spending tons of money on fancy salon products that were not formulated for your unique hair type or produce results that are subpar at best. That’s why I’m so excited that Motions has a new and improved selection of natural hair care products sold at Walgreens! Motions reformulated their shampoos, conditioners and hair treatment products with natural ingredients so you can show your hair the love it deserves. I tried the Pre-Wash Detangling Butter on my last wash day and the results were amazing! The butter is infused with moisturizing Shea Butter, Coconut and Avocado Oils that coat each strand of hair and make tangles easy to comb through BEFORE I start washing my hair. Plus, I LOVE the tropical scent of this product so I can’t wait to use it again. It’s the perfect time to try out the new products for yourself! From now through 5/7/2015, you can save $1 on any Motions hair product when you clip the coupon to your Walgreens Balance Rewards card. Not a Balance Rewards member? Not a problem! You can sign up easily after you click clip to card—it only takes a minute. It’s the easiest way to save because your coupon will be automatically applied to your Motions purchase when you check out at Walgreens with your Balance Rewards card. Find your favorite Motions products at the Walgreens nearest you. What is it? Motions #1 Shampoo – infused with Shea Butter, Coconut and Olive Oils. Restores textured hair’s natural moisture balance while gently cleansing. How does it work? Restores textured hair’s natural moisture balance while gently cleansing. For hair that is luxuriously smooth and soft. What is it? Motions #1 Conditioner – infused with Silk Proteins, Shea Butter and Coconut Oil. Helps seal in vital nourishment and stop the cycle of hair dehydration. What is it? Invigorating treatment balm infused with Ginseng and Spearmint Oil. Provides instant relief from tight, dry scalp. How does it work? Delivers moisture balance, energizes scalp and helps to promote healthy looking hair. What is it? Ultra-moisturizing butter infused with Shea Butter, Coconut and Avocado Oils. Provides deep penetrating moisture and instant tangle-release BEFORE you wash.
How does it work? Smooths each strand to provide the ideal slip and softness to promote less hair breakage. 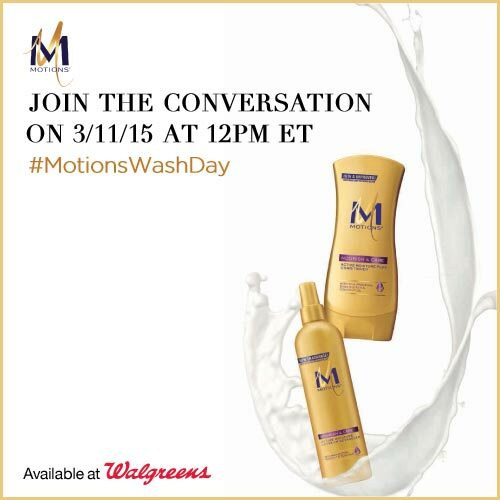 Make sure you check out the Twitter chat this Wednesday and tag #MotionsWashDay ! One winner will receive a $20 gift card and Motions Lavish Conditioning Shampoo and the Motions Smoothing Conditioner Take the steps below and you are eligible to win!